Another fantastic book from Allan Nation, author and editor of the Stockman Grass Farmer newspaper. This is an essential read for anyone raising beef cattle for profit, and absolutely necessary if you custom graze cattle, raise stocker cattle, or finish cattle for slaughter. From the Back Cover: In Pasture Profits with Stocker Cattle, Allan Nation illustrates his economic theories on stocker cattle by profiling Gordon Hazard. Famous in national beef cattle circles for his penny-pinching ways, Hazard has never lost a dime on stocker cattle in nearly 50 years of graziering. 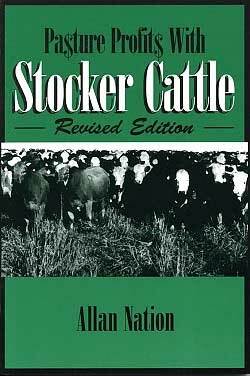 This revised edition shows how Hazard has accumulated and stocked an 1800-head ranch solely from retained stocker profits. While this book is sure to create controversy in the traditional beef community, Nation backs his views with dollars and sense budgets, including one showing investors how to double their money in a year by investing in stockers. Have you read Pasture Profits With Stocker Cattle? Share your review in the Comments section below! And if you'd like to recommend another book about cattle ranching that's not listed among my recommended books, tell me about it via my contact form.